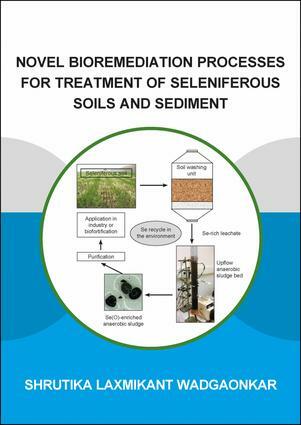 The aim of this Ph.D. was to develop a technology for the remediation of seleniferous soils/sediments and to explore microbial reduction of selenium oxyanions under different respiration conditions and bioreactor configurations. Seleniferous soil collected from the wheat-grown agricultural land in Punjab (India) was characterized and its soil washing was optimized by varying parameters, where addition of oxidizing agents showed a maximum selenium removal efficiency. Aquatic plants, Lemna minor and Egeria densa were used to study phytoremediation of the selenium-rich soil leachate containing oxidizing agents. Additionally, migration of the soluble selenium fraction from the upper to the lower layers and its subsequent reduction and accumulation in the lower layers of the soil column was observed during soil flushing. Furthermore, the soil leachate containing selenium oxyanions obtained from soil washing was treated in a UASB reactor by varying the organic feed. Ex situ bioremediation of selenium oxyanions was studied under variable conditions. An aerobic bacterium (Delftia lacustris) capable of transforming selenate and selenite to elemental selenium was isolated and characterized. Anaerobic bioreduction of selenate coupled to methane oxidation was investigated in serum bottles and a biotrickling filter using marine sediment as inoculum. Finally, the effect of contamination of other chalcogen oxyanions (tellurium) on selenium bioreduction was studied in a continuous system (UASB reactor).